The tiger is the largest of the big cats. It's most famous for its unique orange coloring and black and white stripes. The scientific name for the tiger is the Panthera tigris. The largest of the tigers, the Siberian Tiger, can grow to around 10 feet long and weigh over 400 pounds. This makes for one massive cat and allows them to use their weight to knock down prey and then hold it down. They are powerful cats, too, and can run very fast despite their size. Their distinctive stripes provide camouflage for tigers while hunting. While most tigers have an orange, white, and black pattern of stripes, some are black with tan strips and other are white with tan stripes. Tigers have large front paws with long sharp claws. They use these to bring down prey, but also to scratch trees in order to mark their territory. Today tigers live in various pockets in Asia including countries such as India, Burma, Russia, China, Laos, Thailand, and Indonesia. They live in a variety of habitats from tropical rain forests to mangrove swamps. They like to live near water where there is lots of prey and also in areas with vegetation where their stripes will work as camouflage. Tigers are carnivores and will eat most any animal it can catch. This includes some larger mammals such as water buffalo, deer, and wild boar. Tigers sneak up on their prey and then capture them with bursts of speed up to 40 miles per hour. They use their long sharp canine teeth to grab the prey by the neck and bring it down. If it's a large animal, it can feed the tiger for up to a week. What types of tigers are there? Bengal Tiger - This tiger is found in India and Bangladesh. They are the most common type of tiger. Indochinese Tiger - Found in Indochina, these tigers are smaller than the Bengal Tiger and like to live in mountain forests. Malayan Tiger - This tiger is only found at the tip of the Malayan peninsula. Siberian Tiger - This is the largest of the tigers and is found in Eastern Siberia. Sumatran Tiger - Found only on the island of Sumatra, these are the smallest types of tigers. South China Tiger - This is the most endangered type of tiger. They are critically endangered and are nearing the point of extinction. Yes. Tigers are very much endangered species. 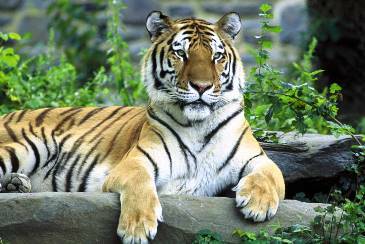 Some think that the subspecies of the South China Tiger is already to the point of extinction in the wild. Despite many laws and national parks to protect tigers their habitat continues to be destroyed and they are still hunted by poachers. Tigers are excellent swimmers and even enjoy swimming and cooling off in the water on a hot day. They live for 15 to 20 years in the wild. The mother hunts and feeds her baby cubs until they are around two years old. Each tiger has a unique set of stripes. Tigers have been known to bring down small rhinos and elephants. 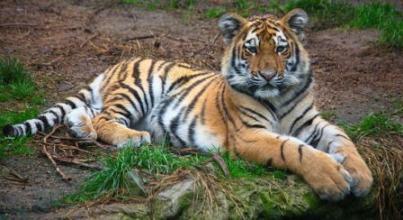 The tiger was voted the world's favorite animal by viewers of the Animal Planet TV show. It is the national animal of India.